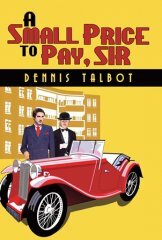 People's Book Prize - Book : A small price to pay, sir? Josh Tolson, younger son of Walter Tolson the car manufacturer, is talked into a risky enterprise by Jane, his ex-fiancé, just at the time when he's trying to track down Liz, his new love. When Ramona also appears on the scene, Ellingham, Josh's manservant, begins to see his own comfortable lifestyle threatened. Recognising a situation that somehow doesn't ring true, he sets out to protect his young master and himself, finding that there is a darker, if amusing side. But will he be able to combat the pull of a powerful lady? Dennis Talbot was born and raised in Derby. Married to Pauline since 1968: they like and laugh at the same things; they're a team. They have three children and eight grandchildren. At 55, Dennis left the electrical industry to take up a freelance job as a road safety consultant. He's met hundreds of wonderfully amusing people in his two careers and many of the things that happen to Josh, the main character have been inspired by just listening to ordinary folk. Putting them down on paper has been great fun for Dennis. Enjoyable light read owing much to PG Wodehouse - but fun and entertaining! Great book! Humour with every twist and turn. Just bought the follow up "Best Foot Forward Ellingham", can't put it down. I loved this. Its a laugh a minute. Fab work, congrats on this great achievement. Well written and well crafted. I love reading this book i have read it loads of times and couldn't put the book down it is so interesting. This book has so much humour it raises a smile and relaxes you into the English characters of yesteryear. It is so easy to identify with the characters. It would be great to hear it as a play on the radio. Can't wait for the next book. Great one to read on the train,voted. If you like P. G. Wodehouse, you'll love this.